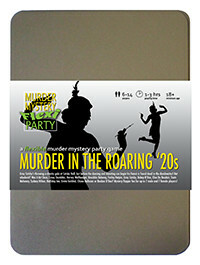 You've been invited to play the role of HARVEY WALLBANGER in Murder in the Roaring '20s. Gray Catsby has invited his most talented and wealthy friends to a charity gala event at his countryside residence, Catsby Hall. But before any dancing and donations begin, Catsby’s fiancée, Ginger Whiskers, is found dead in the dumbwaiter! Join the flappers and dappers to find out who finished her off! Mixing drinks can be hazardous work so you wear your shirt sleeves rolled up with a white cloth over your shoulder to catch any spillages from the cocktail shaker you’re always carrying. Black braces complete your look. You always wanted to be a chemist but unfortunately your grades didn’t agree. To support yourself flunking university, you worked as a bartender and it became your fallback when all other options failed. You amuse yourself by inventing new cocktails and naming them after you, like the “Harvey Wallbanger". You also invented “Anything Mojitos” and the “Flappertini”. I’m Harvey the drinks mixer - also known as the barman. Poor Ginger - or as I know her, Gin & Tonic. I’ve been glued to the bar all day. Serving drinks isn’t just about filling glasses. Charm, wit and repartee - strange names for my siblings I know, but they taught me how to look into a man’s soul or a woman’s clutch and know immediately how to quench their thirst. Ginger was G&T: relaxing, sophisticated and welcoming. The butler, however, likes an Old Fashioned served in a tumbler. Why do you think that is? Because he’s old fashioned and he tumbles - am I right?